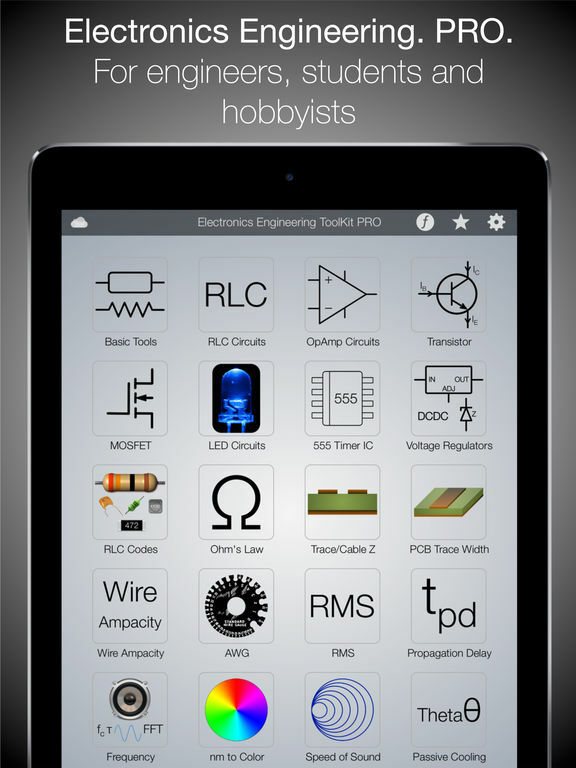 This is the brand-new Electronics Engineering ToolKit PRO for iPad! 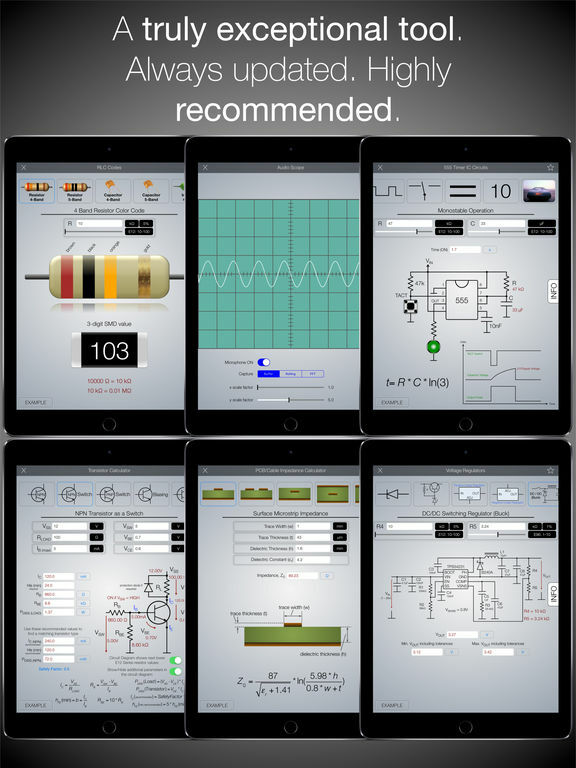 The HIGHLY RATED and RECOMMENDED Electronics productivity app. 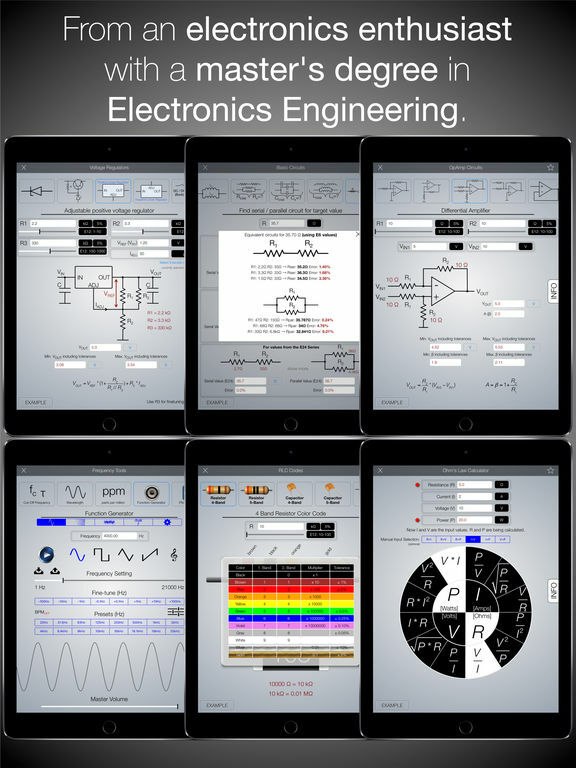 Users say it is the BEST and MOST PRACTICAL EE ToolKit App in the whole iTunes App Store. From an electronics enthusiast with a master's degree in Electronics Engineering. 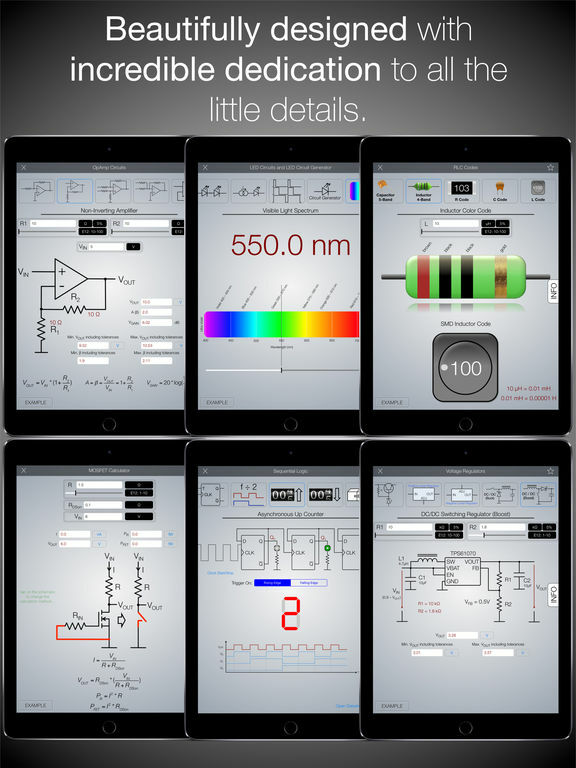 This App is for engineers, students and hobbyists and anyone interested in Electronics Engineering. The App gets CONSTANT and POWERFUL improvements! This app was worth every penny I paid for it back when I bought it years ago. Since then, I’ve regularly used it at work and found it to be an excellent, quick tool to use. 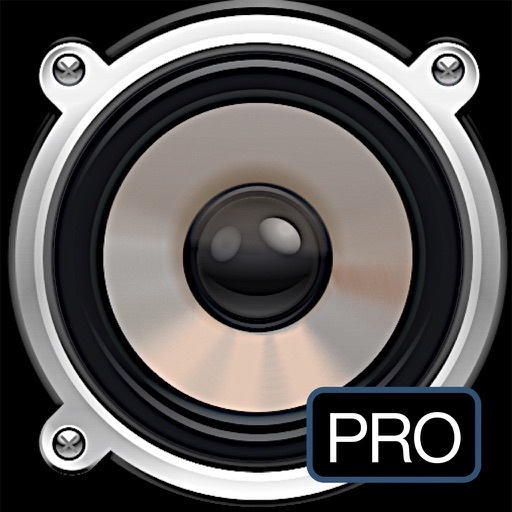 The most impressive aspect of this app are the constant and VERY impressive updates! Massive feature additions and very easy to use interface! 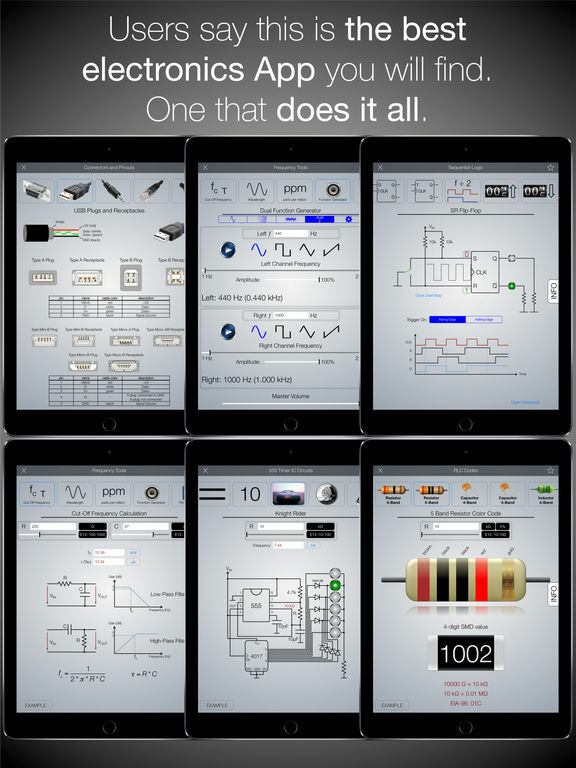 The list of capabilities this app has makes it an amazing value for truly anyone involved in electronics. The EE Toolkit was always a very useful tool, but with the additions in the latest version it is truly an exceptional tool. The author is extremely diligent in managing bugs and improving the tool. Fantastic application. Very useful. Always updated. Good developer. Lots of great bonus tools. Just love it. New File Manager! Simply save and load your calculations! The EE ToolKit now features an integrated File Manager. 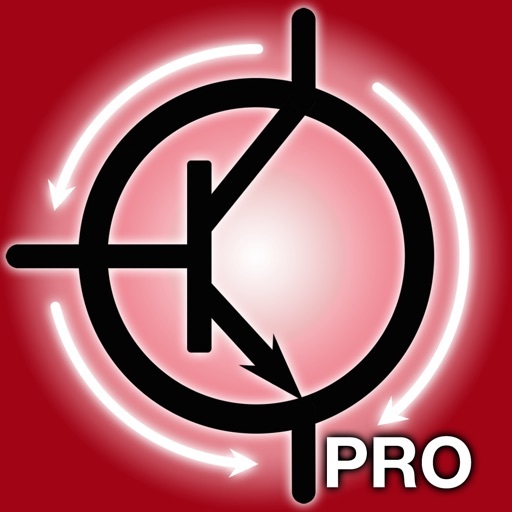 For every tool there is now the option to save as many calculations as you want to and re-load them at any later point in time. Just tap on the folder icon in the sidebar menu and the browser will appear. After saving, the data is stored locally in the App and also synced in iCloud, so it even transfers to your other devices running the same App. Like for the universal build of the EE ToolKit App (that's the free version with In-App purchase to PRO), you can save a calculation on your iPhone and later on open the same calculation on your iPad or vice-versa. Or if you run the 'EE ToolKit for iPad' version on your iPad Mini and on an iPad Pro, these two will sync all saved calculation data. But please note that this feature is tied to your iCloud account, your Apple-ID. You cannot transfer calculation data between different iCloud accounts! Editing is also straightforward. In the File Manager, just swipe left on a row and you will be given the option to rename a calculation, or to delete it. • updated links to NXP datasheets. NXP is now Nexperia.